Nikica Jelavić’s goal – Baines plays a superb ball into Osman, who easily wriggles away from Kaboul before playing in Jelavić, who scores with a controlled first-time effort. Leighton Baines has possession on the left and looks to feed a pass into Osman, the spare man in midfield. Baines has by-passed our two central midfield players with his pass, and we are left two against two at the back. This means that there’s a lot of responsibility on the centre backs to defend responsibly. Unfortunately Kaboul commits himself and is easily turned by Osman. Notice King’s position with Jelavić at this point – gradually he has to show less interest in marking him, and more in getting to the ball. Osman is a hugely underrated player, but the ease in which he turns away from Kaboul is surprising, especially given Kaboul’s excellent form. As Osman has got in behind, King has had to come across to the ball, and Jelavić has intelligently peeled away into a great position. Too many bodies swarm around the ball, and nobody picks up Jelavić, who admittedly still has a lot to do. Does Friedel need to be quite so far over? He finishes superbly though – a first-time side footed effort into Friedel’s far corner. Windy you have it spot on and your right about Friedel he made Jelavics shot easy by being on the left of his goal. This is now our biggest threat to finishing in the top four Friedel has lost is way something he did at Villa late in there season he is 41 and needs a rest. I would dust Gomes of and play him because every shot is going past his tired hands and every cross is sailing over his static legs. Also King and our defence are not playing has a unit Everton had eight or more players in defence when Spurs attacked this is all down to North West Tempo and if we don't start using Kolo Toures wife's slimmers we will keep getting mugged by energetic players i live there and no what's in the water. Friedel's positioning is wrong. What is he doing at the far post? I am also disappointed with Friedel's performance. He is getting too old and losing his energy and agility. He rarely goes out of his goal to punch away the ball from a dangerous cross.We need a younger goalkeeper. In the meantime, Cudicini (or Gomes) should play in his place at times.Our defence continues making errors. When Jelavic received the pass from Osman, King should have gone towards him to close down the space. Instead, he retreated giving still more space to Jelavic to shoot comfortably. 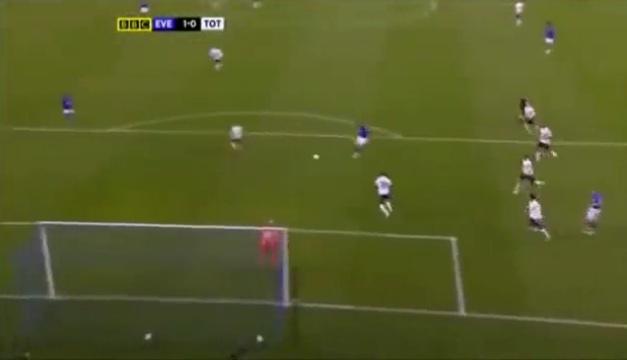 The difference between Everton and us in that match is that Everton knew how to defend. We didn't. I thought that Friedel actually did well to get as much of the ball as he did, we need to focus more on stopping this on off defending that's led to 4 goals in 4 real chances. I also think we need to look at the attacking, we look great when we play wide, but recently we've been piling bodies into the middle, Van der Vaart has the class to do it, defoe saha and adebayor don't link up well enough with each other despite what we thought at Newcastle. I think the 442 could work, but only if we focus on bale and lennon wide. Otherwise van der vaart needs to play. I'd rather have him give his all for 60 mins and let saha/defoe come on to exploit a tired defence. Great ball placement by Jelavic, and he would have gone far to the left post and denied Friedel chance of touching the ball. Bonse - spot on re: 4-4-2 with natural wingers. Doesn't work AT ALL when we don't get the ball wide. TBH I don't think there are many occasions wehere we should go 4-4-2 against a top 4 side, or away against a top 8 side. MatteJerry - it was a fantastic strike. I have to disagree with your analysis and the culprit is King. Why does he leave the player he is marking. Friedel is covering his near post. Kaboul needs to get tight on Osman and force him out as well as make him go for the far post. If King stays tight on Jelajvic then the player cannot turn. While I agree that Friedel tends to stick to his line too much I don't think he was at fault. We are also impotent in the final third due to the absence of VdV and Modric not being in the middle to orchestrate the play.